In this article we will look at what is Mobile Apps Deep Links in Android App and App indexing. We will consider example of implementation and work of deep links on example of one of our projects. What is Deep Link and how we can use it? Deep Linking provides a mechanism to open an application to a specific resource. In the context of the mobile apps, deep linking consists of using a uniform resource identifier (URI) that links to a specific location within a mobile app, rather than simply launching the app. Deferred Deep Linking allows users to deep link to content, even if the app isn’t already installed. Depending on the mobile device platform, the URI required to trigger the app may be different (from Wikipedia). fb://profile/120791238003536 is an example of a mobile deep link. When clicked on a webpage opened on smartphone, it should open specific profile in Facebook mobile app. Given the fact that now the era of mobile technology, this property is very helpful. 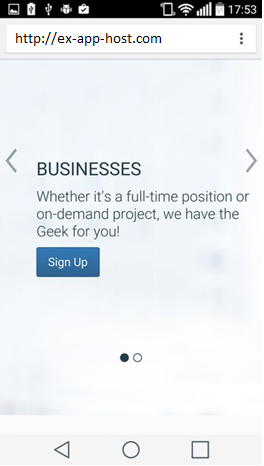 Let’s assume we have a mobile website with registration button that should open our mobile app. Link is http://ex-app-host.com/register from Sign Up button, assuming that ex-app-host.com is our domain name. 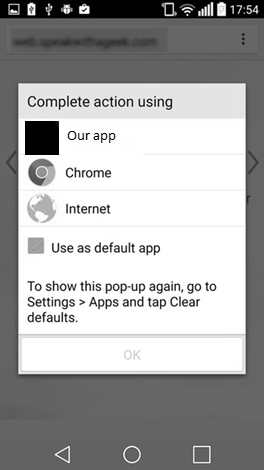 When user clicks on “Sign Up” button in her smartphone (Android in this example), the OS will ask to choose the application to process the request. Deferred Deep Linking allows users to deep link to content even if the app isn’t already installed. How to create Deep Links? So, after user clicks on the links, we need to process the parameters. To do this, we need to receive data activity through intent. In this case, we want to receive the referral code for registration. For example, http://ex-app-host.com/register?ref=234. How to test your setup? After that, our application should start via deep link.